80 pages, published 1997. In 400 step-by-step illustrations, you'll see how to cut almost any shape without a template. 55 charts provide you with accurate yardage figures and cutting directions for each shape in a wide range of sizes. Do you cut patches that don't fit together? Learn how to cut perfect, accurate patches the first time, every time. Do you have the right tools for the job? Find out the best tools for a basic kit, and what you will want to add later. Does your ruler slip? Discover four ways of preventing this problem. Are you afraid of the bias? Learn five secrets to help you master it. Do you know the best sizes to rotary cut octagons and star blocks? See how Magic Measures can help you. Do you want to make quilts as good as the ones you see in shows? Learn the secrets the experts use to achieve perfect results. Do you waste time and fabric using "shortcuts" that are nothing more than time-consuming detours? Find out how various methods compare. Are you tired of wasting fabric? Learn the most efficient way to cut everything from triangles to prisms, including true diamonds, hexagons, kites, and snowballs. Do you rotary cut? 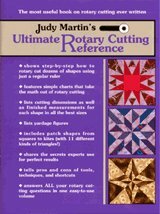 Then you need Judy Martin's Ultimate Rotary Cutting Reference. "If you are mathematically challenged, this book will get you out of trouble and save fabric too. A must-have reference book". "Judy Martin's Ultimate Rotary Cutting Reference is complete, concise and easy to decipher." "I'd like to encourage everyone to buy your Rotary Cutting Reference. It is invaluable when you want to resize a block or design a border to fit. I have yet to design a quilt from scratch, but I enjoy mixing more than one block for complicated looking effects. Often they have to be sized to fit." "For someone just beginning, Judy Martin's Ultimate Rotary Cutting Reference took all the work out." "For years I have relied on Judy Martin's Taking the Math Out of Making Patchwork Quilts as a quick way to estimate fabric amounts for quilts. I'm now replacing my worn copy with Judy Martin's Ultimate Rotary Cutting Reference. Handy charts make it simple to determine how many pieces you can cut from either an 18"-long strip, 44"-long strip, or yard of fabric." "Judy Martin's Ultimate Rotary Cutting Reference is like a bible to a quilter. It is a must have - everything is laid out for you. Since I am somewhat 'math-impaired,' the book has been very helpful." "I LOVE Judy Martin's Ultimate Rotary Cutting Reference. It made me want to stop using all the so-called shortcuts and get down to serious rotary work!!" "This is the most complete guide to rotary cutting on the market."